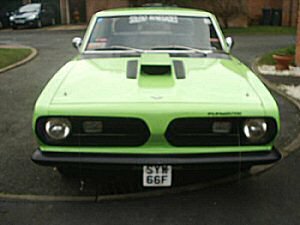 I acquired the Barracuda about a year ago but with no mot so I set about doing the work that would be needed to get a pass. I had to have welding done which I would have expected being an older car, but what I didn't expect was to have to have the front wheel bearings replaced. 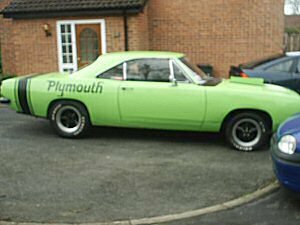 This was carried out by the garage that did the mot - big mistake. After they fitted new wheel bearings I was driving home when I started hearing a knocking noise, I slowed down and as I did this the front wheels came off and smashed the front wing!! (They had not tightened the wheel nuts up). The garage agreed pick the car up and take it back to a body shop for repair. I have taken out the original front seats and replaced them with Vauxhall Calibra seats which took some messing around but I finally managed to get them in and I'm fairly happy with them. The colour is from the fiat range but I don't know which one for sure. The engine is a 318 but ideally I would like to get a 383 or a 440 fitted, that's presuming it will fit, I don't know as it was a straight 6 when first built.